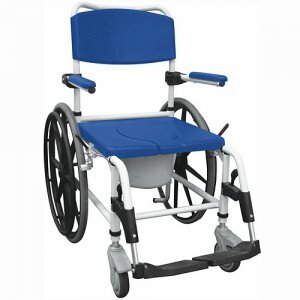 Can be positioned over a standard toilet or used as a portable self contained commode. 24" rear wheel with brakes for self propulsion. White aluminum frame is attractive and rust resistant for use in the shower. Attractive. Padded seat back and arms. Seat cut-out provides maximum comfort and convenience. 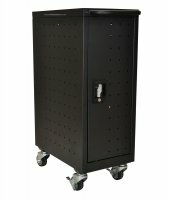 Width (Open): 24.5 inch; Height: 38 inch - 39 inch; Seat to Floor Height: 20 inch - 21 inch; Back Height: 19.25 inch; Seat Width: 18 inch; Seat Depth: 17 inch; Length with Footrests: 42 inch; Product Weight: 41 lbs.